When I saw the CityChic Open Rose dress in “Fruit Salad” in Gwynnie Bee's new releases I just had to try it. Summer is the time of the year to wear all the fun prints, and a dress covered in fruit and flowers is just that. 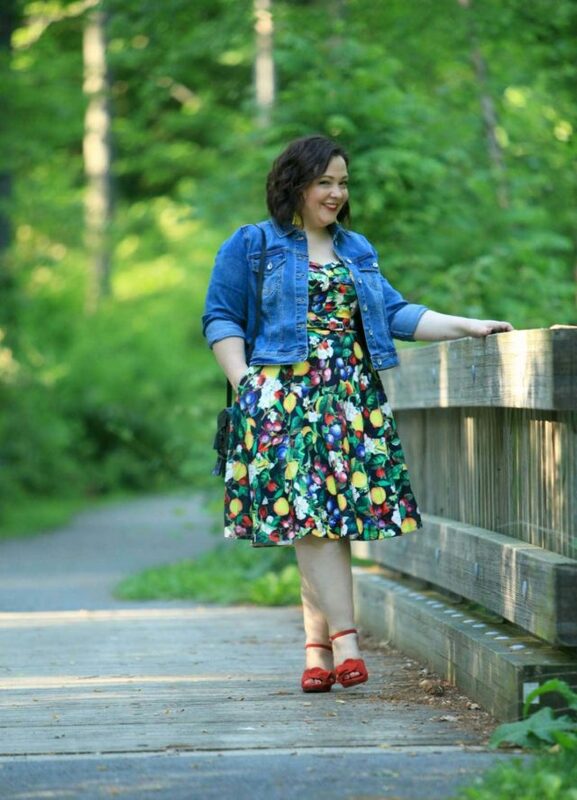 This dress is available at Gwynnie Bee in several other prints: florals and fireworks and more. While this print may be a bit too wacky for my workplace, I can't wait to wear it to a cookout or date night. And what makes this dress so great? I'm wearing my everyday bra with it! The straps are a hair wider to keep them covered, the back is elasticized/smocked and high enough to cover everything. Oh yeah, and it has pockets! As a reminder, if you're in New York City, I'll be at the Gwynnie Bee Flatiron pop-up shop tonight from 5-8pm. Would love to meet you! Ellos recently sent me some pieces and this jacket is one of them. Not knowing the brand well, I decided to go large with sizes and got this denim jacket in 16. I should have gotten a 14; while it fits really well in the arms and shoulders, the body is a bit too boxy for me. I'll be honest, the pictures I ended up choosing from the ones Karl took were the ones where the jacket looked the best/less boxy. But I like the shorter length; it works far better with dresses than my J. Crew Factory denim jacket. 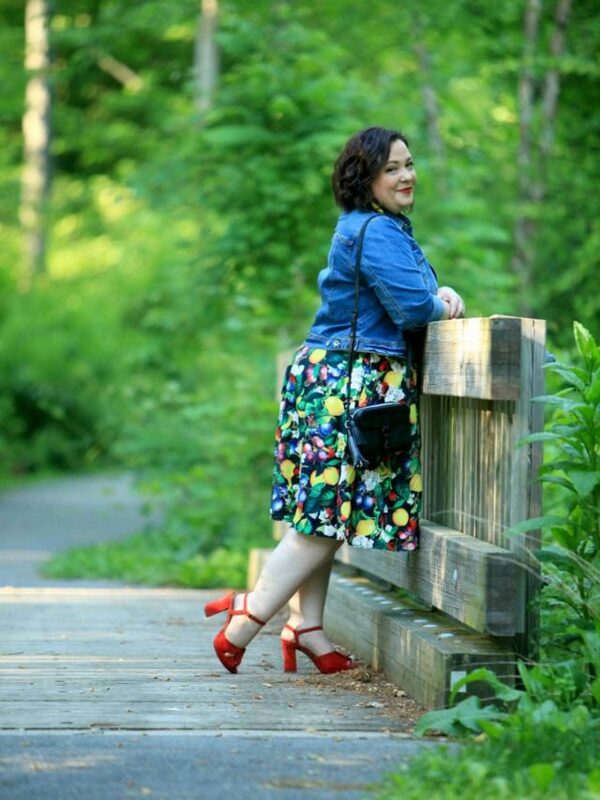 The denim is nice – not too heavy, stretchy but so tightly woven it doesn't look stretchy and it doesn't stretch out. 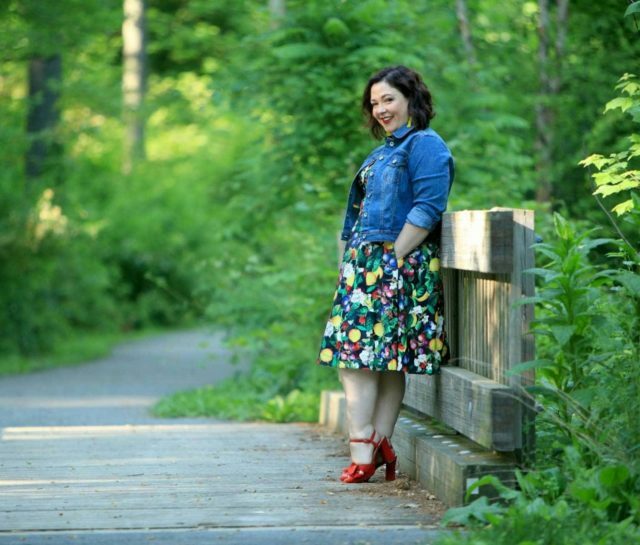 I wore their shirtdress (M) and wedge espadrilles in my Strong Women in Fashion post, and as I type this I'm wearing their Off the Shoulder Tee in 14/16 (which isn't off the shoulder and is made of awesome fabric that keeps its size and shape after being washed and dried). Expect to see more Ellos on the blog; they have great basics in sizes up to 5X and even wide width shoes, all at really nice prices. You look amazing and that dress is very flattering. The jacket fits you well. You look gorgeous! Be sure to check out my latest post! 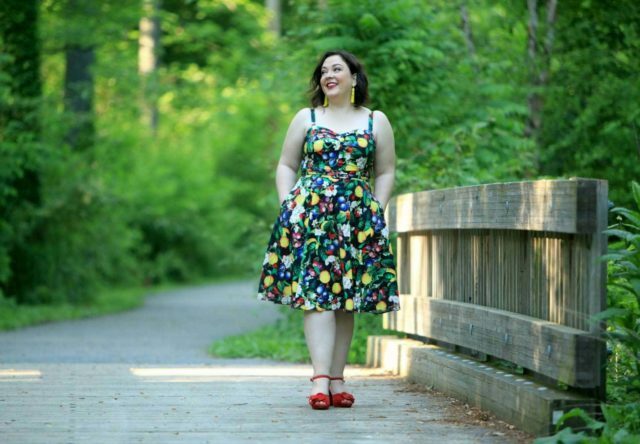 Super fun and summery–and what a fantastic neckline! 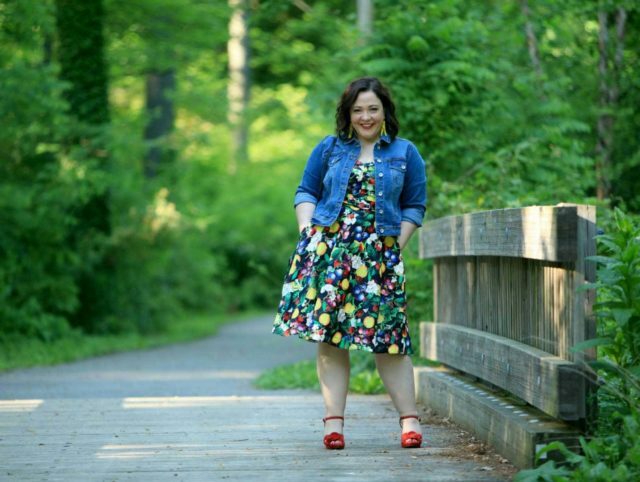 Totally, this dress is so flattering and fun! I love the fruit pattern! I bought those shoes and I’m sitting in a hotel room realizing I SHOULD HAVE PACKED THEM. Sigh. Boyfriend jeans and a linen tshirt. They would have just added something. Next time! Aren’t they awesome shoes? And thank you! So cute! Fun and flirty. I recently bought some things from Ellos and every single one was huge. Some nice things, but hard to tell how they’ll fit since everything was sized so very much bigger than I expected. I would have to size down maybe twice? It was kind of weird. I had a mixed bag… literally. They were kind enough to send me a good selection of pieces and some I LOVED, some were a bit off in sizing. The cool thing is they really wanted this kind of feedback, they’re working on mastering the fit so hearing this kind of stuff will help them get better. this outfit is so cute on you!! That print is fabulous, so fun! I love the shoes too. That dress is so gorgeous! That pattern is absolutely stunning. And I love how you styled it with the denim jacket, it added a more casual vibe to the look. 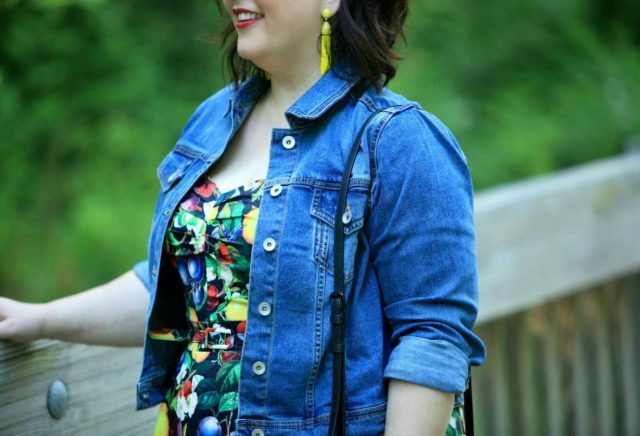 I’ve always loved the blue jean jacket paired with a dress and this look is perfect.The print on your dress says spring is here and summer’s not far away. You’ve reminded me that I should bring my denim jacket out and wear it with my sleeveless dresses after Memorial Day when we dress casual at work. In the meantime, I am so looking forward to seeing you in person tonight at Gwynnie Bees in NYC! This look is right up my alley, Allie!! 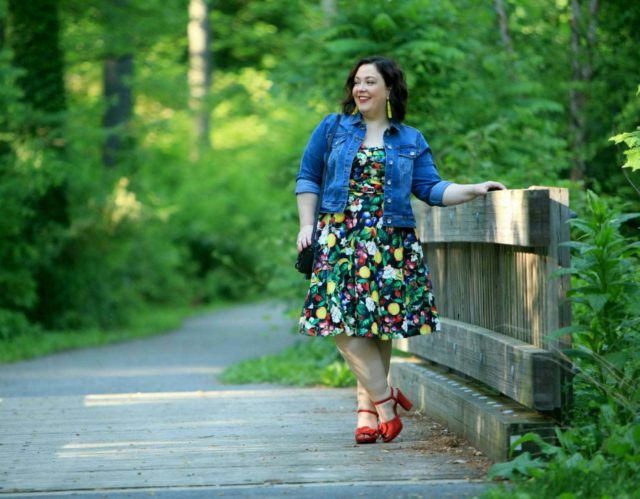 We just wore our denim jackets with dresses this week on my blog and I think it’s my new favorite look!! It seems to be so approachable, and ageless! It’s such a versatile and approachable option for sure!